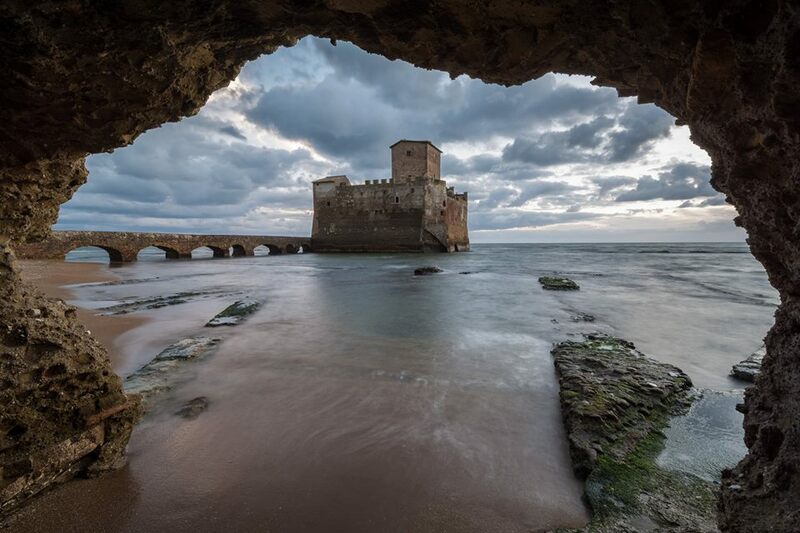 Connected to the mainland only by a bridge to brick arches comes to life Astura Tower, a fortified tower on the coast of Lazio a (semi-isola) island belonging to the town of Nettuno, from which you can admire the beautiful skyline of Palmarola island and San Felice Circeo. Torre Astura which takes its name from the river, was the scene of the escape of Marco Antonio and was chosen by the greatest exponents of the time as the favorite place to build their villae otium. 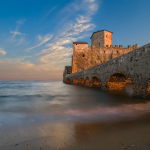 Today this land is developed for more than eight kilometers of Nettuno a military range, which would make this place a place closed to tourists. 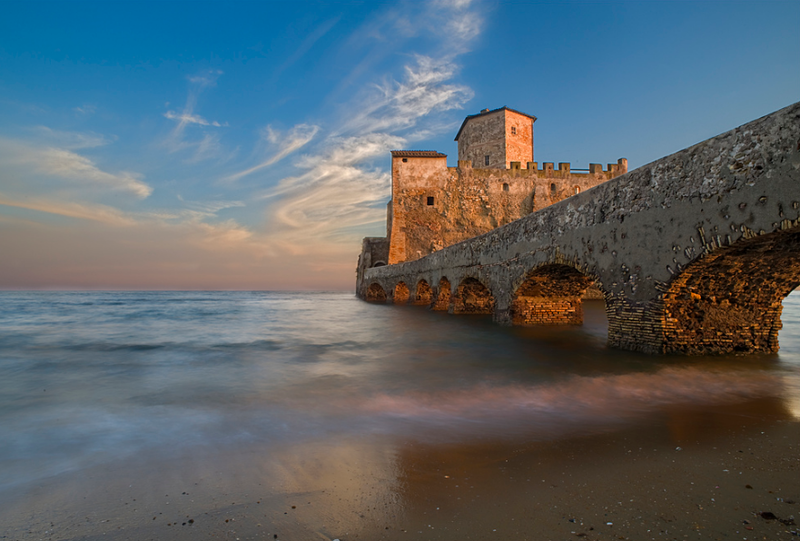 In medieval times Astura Tower was a place inhabited and the site of an ancient Roman port on the eastern part of the complex in fact it is possible to recognize the two piers of the artificial harbor. Near the coast even today we can admire the fantastic remains of the fishpond at that time was about 15,000 square meters. Just on the remains of this port around 1193 the Frangipane, the lords of the place, to protect themselves from the Saracens and built a fortress at the Pentagon under water connected only by narrow bridge. 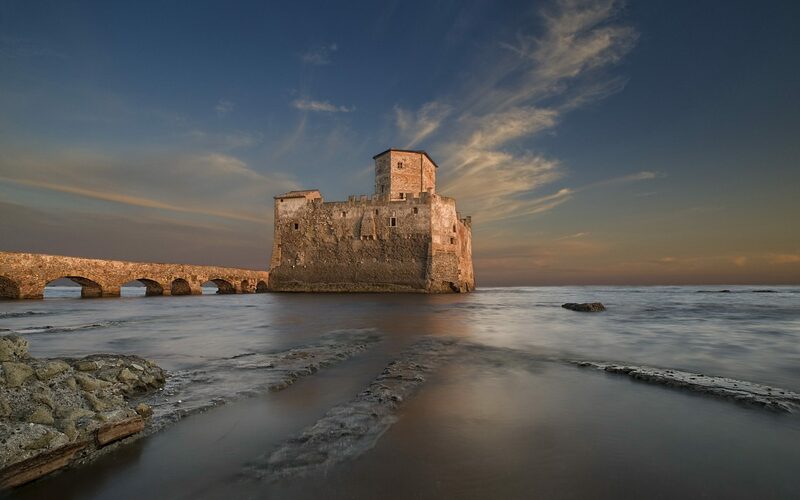 Plinio il vecchio described in his texts Torre Astura like an island, news that over the years has been confirmed by the remains of a bridge that connected the island to the mainland. 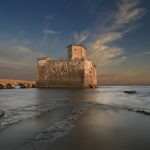 It is said that on that ‘island was later built following the abandonment, the tower, and that prior to the construction of that there was the villa which Cicerone lived here between 45 and 44 A. C. Cicerone himself described this place as “Astura locus quidam amoenus, in mari ipso, qui ab Antio et circejs aspici possit” or “Astura the place, pleasing to the sea it self, which can be seen from Anzio and Circeo.” The Romans built a harbor and an imperial palace of which still remain the ruins. They stayed there probably Augustus, Tiberius and Caligula. In 987, Count Benedict Tuscolano and his wife Stefana donated of S. Leone abbot of the monastery owned land in Astura. And the monks built the church and monastery. Extinct family of Tuscolani, Astura went to Leone and Manuele Frangipane, their relatives. Who, in the mid-sixteenth century, rebuilt the castle, giving it its present appearance, the villa was sold in 1594 to Clemente VIII Aldobrandini after being the property of the Caetani and the Orsini, in 1426 Astura passed to the Colonna. From these, it extinct the Aldobrandini family, passed to the family Borghese, from which it was sold to the municipality of Nettuno in the seventies of the twentieth century. Until then the depths of this little paradise in the countryside rich in archaeological finds, were objects of uncontrolled looting. Elegant Renaissance style were added over the years to the Roman works and the rustic medieval. Of an ancient “Astura Forest”, later called “Selva of Brick”, remain today the modest, albeit lush, testimonies of Astura pinewood and the forests of Foglino and Crosses. The place has inspired writers and poets for centuries, “The flora here is of a tropical splendor, the ivy clings to the majestic oaks,” And again Giuseppe Brovelli Soffredini, in 1887 “the huge, great and impressive garden, which soil was carpeted by a sparkling green in the sunny spots and a bluish green in the shade of age-old oaks. “Gabriele D’Annunzio, who was in March of 1897, tells of a” beautiful pine forest, the trunks are so thick that leave just a few penetrating eye of the sun and tawny trees, with their branches loaded with needles, shine this divine iridescence, this sovrammirabile work of enchantment-aracnea “. 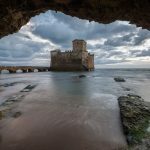 In more recent times Torre Astura becomes common place setting for several films and television scenes, while during the summer season in this area of ​​breathtaking beauty rich in history comes to life a real bathing and you can see the boats yachts and sailing boats in the open sea animate the coast.